Did you know the week between Christmas and New Year's can be a big game changer for the profitability of your business? If done right, you can net more from this period than any same number of days period during the year. Here are some tips to help you get the most out of the end of the year for your retail store. Consider the day after Christmas the official launch of gift card season. People are in your store to use the gift cards they got for Christmas. Think of some ways you can add a little something extra to those customers' experience. After all, it may be their first time in your store, so you need to wow them. Christmas is over, so try to make the store reflect that with your visual merchandising. This means changing the music, taking down the holiday-themed decorations and December promotional signage, and giving the store a fresh look. Chances are that many of the people coming in now were there prior to Christmas and may be energized to look around more if the atmosphere has changed. Don't wait until January—have your markdowns ready for the 26th of December. The faster you turn this merchandise, the sooner you can freshen up the store. Many retailers wait until they have a January "clearance" sale to clean out the inventory. While holding sales is a good practice, waiting means you are not ordering fresh goods until February and, in turn, your store is not "new" until March. Be generous with your bounce back coupons with customers—stuff their bag with incentives to return. Customers get out of the "shopping frenzy" mode in January, so try to keep them shopping in your store with some great incentives. 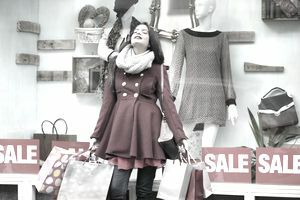 In addition to getting your markdowns priced, you should also use this time to get fresh full-priced merchandise out on the floor. Remember, many of these customers are using someone else's money, in the form of a gift card, so they are more likely to look for the new item than the leftover one and the new items will carry the full profit margin for you. You can reduce your ad spending—it's the post-Christmas season, so everyone's stuff is on sale. Instead of giving your money to the newspaper, give it to yourself or, better yet, use some of it to motivate your employees' customer service performance during these crucial days. Another creative use for cash otherwise spent on ads is to use some on incentives for your customers. In the Christmas rush you have been using more people than ever, but now the traffic will shift from selling to keeping it sold. Staff your store to help convert those returns into exchanges. Too many retailers simply staff to handle returns, but their goal should be to handle exchanges and new sales. Train everyone on suggestive selling techniques to use when they are processing a return. Also, if you do a lot of gift card sales prior to Christmas, then a lot of your traffic will be new sales. Be ready to sell. During the holidays, our employees can often be too busy to always enter customer information in your customer database. Spend some time emphasizing the importance of asking for customer email addresses and renew a sense of urgency around your loyalty program. Consider that your employees have just gone through the most grueling four weeks of their working lives and you are now asking them to give you even more. If you've been endeavoring to keep your employees healthy during the holidays, then this week you should do things to show them you care. Starbucks runs, a masseuse in the break room, and catered lunches are just a few ways to show your appreciation for all they have done for you this selling season. The bottom line is that other than big sales, customers don't expect much from a retailer during this week. Most retailers are "out of gas" and just coast to the new year. If you hit your numbers, it's definitely tempting to sit back and not keep pushing, but there is no better time of year to delight customers than the week after Christmas. We all know that the last impression is the most important one—make the last impression of the year be what carries you through the next.